If you are paying for Self Storage or cannot Park your Car in the Garage. Call Today! Unhappy with your garage storage? Can't park your 2nd biggest asset, your car, in the garage? Can't see the garage floor? Or perhaps you are completely organized and want to step up to Custom Garage Cabinets and amazing Houston Epoxy Flooring. We have solutions for your Houston Garage Organization and we have helped over 8000 families just like you since 2003. Ideal Garage Solutions of Houston is #1 in TX Garage Storage. Why? Not just because our Houston Garage Shelving is the most innovative, high-quality garage storage concept in America. Not just because we have installed over 20,000 Garage Overhead Storage Racks. Not just because we offer the safest and strongest Garage Ceiling Racks at the most competitive prices. It's because our own professional, well-trained and certified installers can handle virtually any overhead garage Houston storage problem and they absolutely love seeing a smile on your face when they are finished. Call us today. We'll help you SAVE MONEY on your project and put a smile on your face. If your looking to have your Houston Garage Floors redone, we also do Houston Epoxy Garage Flooring for the Garage. 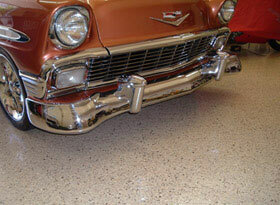 Quality of Houston Epoxy Floor is based on how well you prepare the surface for the epoxy paint. We grind the floors before applying the epoxy and the flake. All our prices are based on a Full Broadcast of flakes and comes with a lifetime warrany. After just a 5 minute conversation, we'll give you an estimate and arrange a time to meet with you at your home. We'll take measurements for your TX Garage Storage and make recommendations based on your garage storage needs and your ceiling structure. The best part is we come prepared with most of our storage products and can install the same day! We can have you organized and your car back in the garage by the weekend. 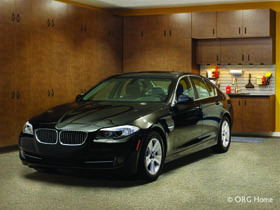 This complete Garage Storage Solution will allow you to see your garage floor again! Our quality Garage Racks and Garage Shelves eliminate wasted space by installing them above your garage door, and at the same time create valuable new storage space and added room and gets the Garage Organized. A ceiling mounted rack system works perfectly for the organization of the many items that aren't used everyday, but can still take up valuable floor space. Our high-quality Wall Shelves are the most effective way to create more garage space, get rid of the clutter, and put the items that you need within close reach. At a rating of 400lb they cannot be compared to the flimsy shelves you get at the box store. 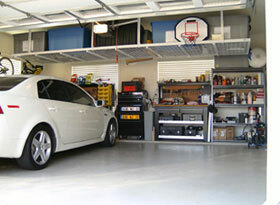 We are organizing Garages one garage at a time Call us today for an estimate! Houston Garage Cabinets, Houston Garage Wall Storage, Houston Garage Racks, Houston Garage Shelving.